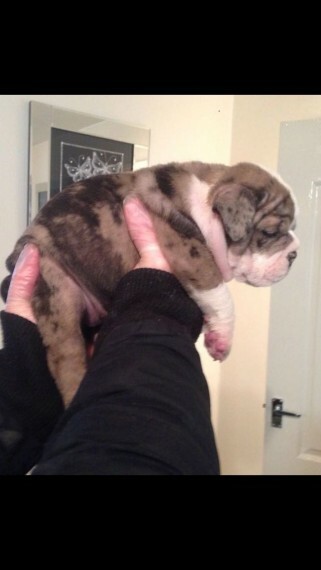 Here we have for sale an exceptional litter of 11 merle British bulldogs. Born and bred in our family home with no expense spared. Mum is our in house family pet. she is chocolate merle. Dad is the famous lilac tri stud SEB .EPIC bullies lines.. 8 girls and 3 boys available... We have worked tirelessly round the clock to ensure these beautiful babies have had the best start in life. They all have amazing personalities. Great with kids and other dogs.... and even play with the cat. Pups will leave... vaccinated to date. microchipped. wormed and flead. blankets and toys and plenty of food. Pups we have available all at great prices.... All pups are triple carriers .carry every color. White pied chocolate Merle female 1500 Blue ghost merle female 3000 Red cryptic merle female .1. 3000 Red cryptic Merle female .2. 1500 Lilac fawn Merle female 6000 Genuine enquiries ONLY. no pic collectors or messes.